So, are you getting ready to create your holiday cards?! Or are you one of those people that have had them done and addressed for weeks now?? Hint…I’m not one of those early bird people. In any case, I’m ever grateful to websites that you can create your cards on – especially if the designs you can choose from are unique and customizable. In the past, I’ve found myself printing and cutting and putting together cards each year and stressing so much about getting them done and out on time. This year I will be using Minted.com to produce my holiday cards. 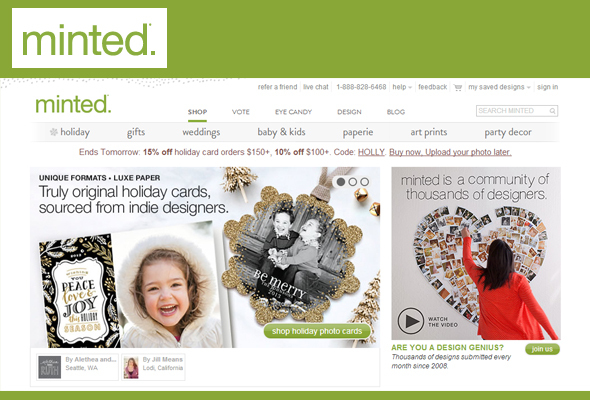 Minted.com has so many designs to choose from – not to mention plenty of customized formats and design options. If you’re unsure about using photos there are designs for no photo cards – though there are plenty of precious photo design cards that take from one photo up to many, many shots. I’m feeling particularly impartial to this minibook design right now – I love book designs and this little gem has up to 7 pages you can customize! I might also be swayed by all the holiday Pet design cards!! Who wouldn’t want to get a card with Bubba’s photo on it? If by any chance you cannot get your act together before Christmas (I’ve been there), give yourself some extra time and think about sending a New Years card. It is so incredibly easy to get around the Minted.com site, that I find myself spending lots of time dreaming up ideas for creating cards, minibooks, journals, calendars, magnets, party decorations, gift tags, art prints and so much more! They even have photo backdrops so you can follow all the rage with a photobooth at your next party!! Need some inspiration…. check out (and be prepared to view this page for HOURS!!) these Minted.com inspiration boards. Are you a photographer looking for unique fully customizable client gifts? Well, they have you covered, too. There’s a place for designers to submit designs they’d like to see used on the site. (thousands of designs are submitted each month). AND even a minted.com design competition you can think about submitting you can try to win. As you can see, the options are endless on this site. I’ll keep you posted through my Facebook page when I choose a holiday card design….though I don’t think it’s going to be easy to choose this year! Have you tried minted.com already? If so, leave me a comment about how it went and what designs you chose – I’d love to hear about them! Disclosure: I was offered credit on minted.com for a review of their site. I’m so happy I received this offer as I’m super excited to use their services after checking out their easy to use site with such fabulous designs. Oh Neat! I’ll have to check this out!